Costco is a wholesale store with a lot of member-only deals on its product range. You can always find something that is on sale for members and use the Costco Ad to get them. Their product range is huge. An enormous number of products are available. Electronics, computers, appliances, furniture, gifts, jewelry, garden, home, office supplies, clothing, health, and many more categories including grocery are available in Costco stores. Usually, there is a limit of purchases per customer if something is on sale. Costco is the second biggest retailer after Walmart in the world. Since they have very big stores, they only have 770 locations. It also has locations in Europe, Asia, and South America. 533 of them in 44 U.S. states. Since they focused on wholesale trading mentality, they usually keep the prices low, sell greater numbers with limits. Not all the purchases are limited. In a Costco warehouse, you may find 4000 different products or even more. Shopping at Costco is very safe in terms of keeping the costs low. This can be proven by the example of the incident that happened in 2009. Costco refused to sell Coke since they didn’t keep the wholesale price lower. Costco’s stores don’t have fancy decorations this is because they don’t want to increase the prices of items by turning on the lights in a sunny day. Also, beware that Costco has a changing product range usually. Exclusive buyers' pick products are limited to 10 purchases for each item. 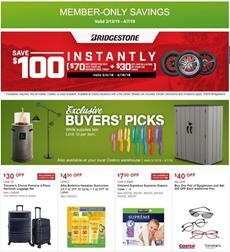 Costco warehouse has some great savings for members only and they have coupons in the latest Costco Ad. These deals are effective until 17 Apr. 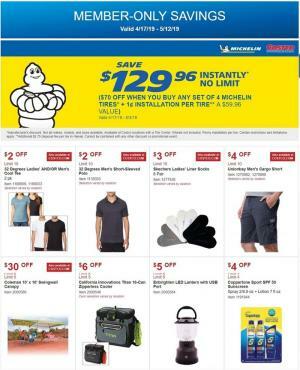 If you are thinking of changing your tires for Spring-Summer, save $100 at Costco Warehouse. Buy Calvin Klein boxer brief of 3pk. with $4 off coupon. Samsung 55" Class 4K UHD LED LCD TV and more TVs are available in stocks. Visit pg 2 to see them. Costco really has interesting discounts on many products. Pay only $75 for Nutrisystem $100 gift card. HP Pavillion x360 is a mobile, fast, good-looking, light-weight computer for most of the daily tasks. It has a full HD screen. Don't forget to see more deals of the future Costco Ads. You can get emails by a free subscription. Follow our Facebook page to get these on your feed.